So there I was on the way to the farm, when I suddenly realized that I didn’t bring the dogs’ leashes or harnesses! Uh oh. The dogs were already in the car and it was too late to turn back. I considered stopping at a pet store and looking for a suitable leash and collar, except that there were no pet stores along the way. I was just going to have to wing it and rely on my dogs’ training and good sense! Before we got the horses, I would let the dogs run loose on the farm. The farm is a great place to work on recall and concepts like “that’s too far”. I would let them run around without a leash as long as they stayed where I could see them. If they went too far away or didn’t come when called, then they would have to go back on the leash. Then we got the horses. I felt bad but it seemed prudent and necessary to leave the dogs at home when we first brought the horses to the farm. We wanted to get the horses used to the farm. When they looked like they had settled in nicely, we started bringing in the dogs one at a time. We were being very cautious because we wanted their introduction to be as pleasant, calm, and relaxed as possible. We were trying to avoid spooking the horses with lots of running around and barking and yapping. We wanted the dogs to accept and respect the horses as big and powerful members of the farm family. The goal was one day to have dogs and horses that respected and got along with one another. If they enjoyed each others company, they that would be a giant bonus. And then all of a sudden on their third visit to the farm since we got the horses, it was no leash day! They did surprisingly well! We had a guest with us that day. The husband wanted to show him the grounds soon after we arrived. The dogs did great at following us! Barkley disappeared into the trees once, but came running when I called. Later on when we were just relaxing in the house, the dogs just stayed nearby. They would run and play in the grass right in front of the house. It was easy to keep them close by. We were walking back towards the house. It was really hot and I thought to myself that we should pass by the hand pump in the “owl field” so I could wet the dogs. I told the dogs, “Go to the pump!” The husband said, “They don’t know where that is.” And then to our amazement, they turned left at the intersection in the path and headed to the pump! When they got there Barkley lay down under the tap! Either they remembered or they read my mind! I think my mind short-circuited a bit at that day from the shock of not having leashes or harnesses on me. I cannot remember what I was doing when Barkley suddenly ran into the horses’ paddock! All of a sudden, there he was. At first he looked like he was running after the horses. Then he looked like he was running away from them. I stayed outside the paddock and called him, in case he was panicking and didn’t know where to head. Our caretaker ran inside the paddock and tried to distract or block Batman when it looked like he wanted to kick Barkley! Barkley looked so tiny. The horses looked like they were prancing gracefully while eying Barkley. It was a pretty good day, except for those two near-death experiences. The good thing is I think Barkley learned that he shouldn’t mess with the horses. Momo already did that running into the paddock bit during his 2nd visit to the farm with the horses already there. 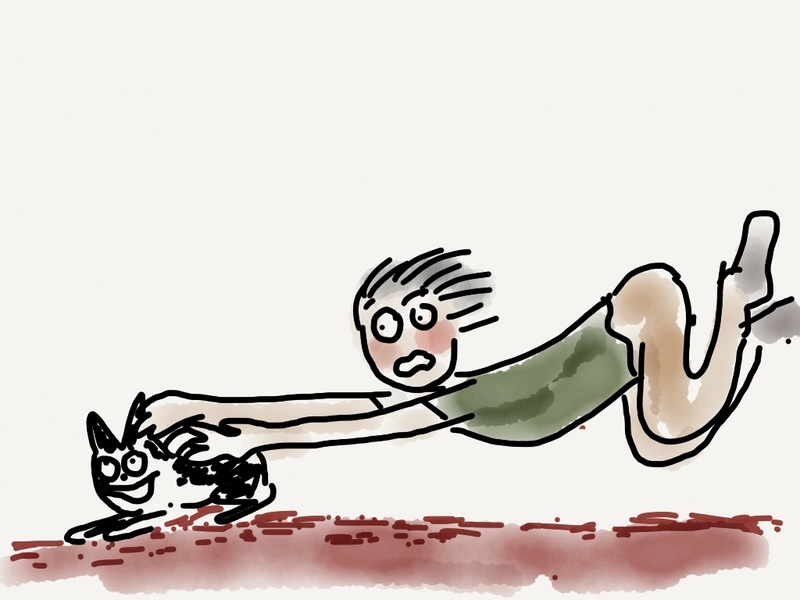 Like Barkley, he started out looking tough but ended up running out for dear life. I’m really glad they now both seem a little intimidated by the horses. It’s safer that way. 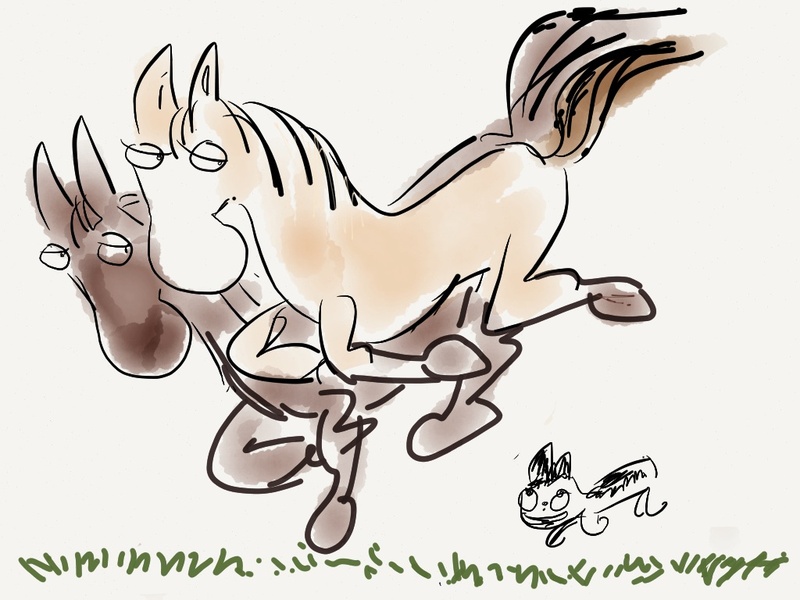 A friend told me about some Jack Russels that grab onto the horse’s tail and hang on for the ride. For fun! Thank goodness my dogs are not that daring! I used to worry about how it was all going to come together — the dogs, the horses, and the wild birds. I wasn’t sure if they could all peacefully co-exist. This day put some of my worries to rest. I think it’s really going to happen! It’s going to work! S—this CRACKED me UP! I know it was stressful but it was so funnily written! Loved the illustrations too! Thanks Sands! Good thing it all turned out well .. even the forgetting to take pictures part. I was “forced” to draw! I really, really hope Barkley is now a smarter and wiser dog. I hope!! Thank you Telyds! Just click the blue “Follow” box at the bottom right of the page, put in your email address, and you’ll get an email whenever there’s a new post. So funny and well written! Hello from Canada! Hi Jo-Anne! Thanks for dropping by! looks like your horses and dogs (and the combination of both) will continue to give you many entertaining stories to tell! great drawings! I see where your daughter got her artistic genes from…I love your art work and funny stories. Please post more drawings! Hi Arlene! Thanks a lot. I think I will make more illustrations! It’s fun to try to capture certain moments that in a drawing. Sometimes a camera doesn’t cut it! Thank you for the ‘follow’ ‘on understanding your dog’……. very much appreciated. Yes, I watched that musical! I enjoyed your story, even if it wasn’t ha-ha funny as I expected from the title. It was the only way I could get the name of the cinema into the title. Glad you enjoyed. You could bells in your dogs so that they don’t startle the horses. Try positive reinforcement by giving treats to both horses and dogs so that they associate each other with something pleasant. Love the drawings!!! Thanks Carmela! The horses really seem curious more than anything else. They really stretch their necks over the fence to try to get a good sniff at the dogs. Barkley sometimes reacts by barking or jumping, which I want to discourage. I’ll try the positive reinforcement with treats!